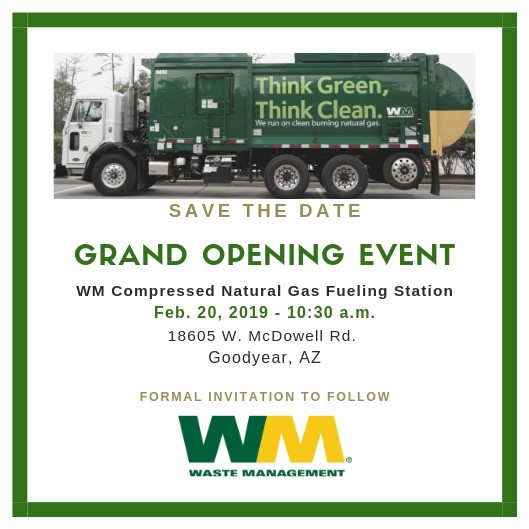 Join us for the Grand Opening of Waste Management's new Compressed Natural Gas Fueling Station! Keep an eye out for the rescheduled date! Waste Management has a new fleet of Compressed Natural Gas (CNG) fueled trucks that will be used to service Goodyear. These trucks emit nearly zero particulate emissions, cut greenhouse gas emissions by more than 20 percent, and are quieter than diesel trucks. These vehicles will reduce the use of diesel by an average of 8,000 gallons per year.